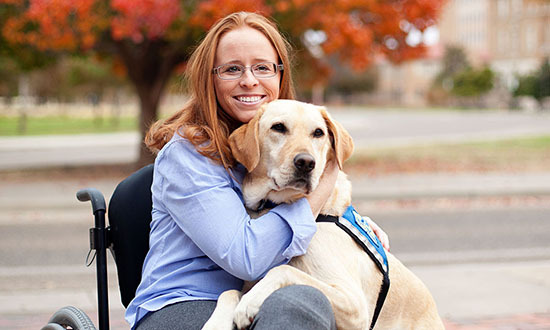 Chelsey began school at Texas Tech University before she applied for a Canine Companions for Independence assistance dog. However, Chelsey decided to leave school before receiving her degree. Chelsey and Pablo graduated from Canine Companions at the grand opening of the South Central Region Kinkeade Campus in November 2015. Since then, she returned to college at Texas Tech, graduated with a degree in finance, and landed a job at a large bank. Pablo was not left out of these celebrations. He was in Chelsey’s senior pictures and even walked at graduation with her in his very own cap and gown. Today, he attends work with her, making asking for help a thing of the past. Chelsey says she would not be where she is today if it wasn’t for Pablo. More than anything, he has provided her with consistency and confidence.